This trail takes hardy hikers to some awesome cliffs two miles downstream from no hands bridge. The trail is in the Auburn State Recreation Area but is not endorsed or maintained by them. I think it is an old trail, refurbished by persons unknown, as I see remnants of an earlier path along its way. The trail is very easy at its beginning and rather difficult nearest the cliffs. Not for young children or the squeamish. This trail is on the El Dorado side of the river and does give good access to the river from numerous side trails along its length. It also comes darn close to reaching the old Pardner Rock trail that is just upstream around the bend. Directions: Find your way to the famous 100 year old Mountain Quarries Bridge, better known as the “No Hands Bridge”. If you climb up from the bridge on the El Dorado County side (Training Hill or a.K.a. 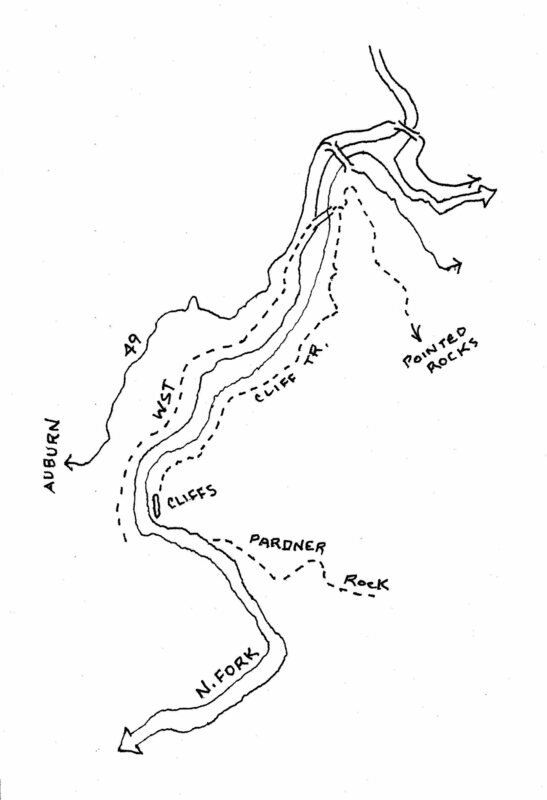 Pointed Rocks trail), the trail goes Right at the very first switchback. This trail is far from official and not well known but I like the cliffs and the idea of connecting it to the defunct Pardner Rock trail. You don’t have to go all the way to the cliffs as it is a better trail for access to the river before you make the final scary section right before the cliffs. Somebody continues to work at improving the entire way so it may someday be easier to use. If you do reach the cliffs you can continue beyond and find a trail down to the river at a nice bar around the corner. This is where the North Fork makes an eastward bend towards Robie Point. About half a mile farther is the Pardner Rock trail coming down from Cool.